In a fight for your life where bullets are going in both directions, movement can be the difference in who goes home and who doesn’t. But, there’s a continual debate about whether you should try to shoot on the move or move to cover AND THEN shoot. So, which is right? Which should you do? The fact is, it depends…and you’re going to figure out which is right for you today. I was talking with a West Coast law enforcement instructor a few weeks ago…Mark is former Army SF and we have had some great discussions on firearms training best practices over the years. Mark was telling me about a number of cases where officers he’d trained had been in gunfights where they stepped offline, put effective hits on the threat, and ended gunfights without getting hurt. What was telling about these cases was that there were holes in the walls and cars where they were before they moved to the side as they were drawing. In other words, if they hadn’t moved, they would have been hit. It may seem pretty cut-and-dry that you should move laterally in a gunfight to avoid being hit. Do you start your draw and then move? Do you start to move and then draw? Or do you do both simultaneously? Once you’ve got your gun presented, do you shoot on the move or stop to shoot? For most people, the answer is to move violently and rapidly towards cover, then draw your weapon and engage the threat from cover. That is the answer that has the least likelihood of failing for the most people, even though it won’t get the threat stopped quickest. It’s pretty common to see people start tripping over their feet on clean floors and completely miss man-sized targets at close range when they try to move and shoot at the same time. Because drawing, shooting, and fast lateral movement are all complex motor skills which each require a lot of brain power to do well. Each of them on their own could max out your brain. Combine them at high speed and you’re likely to have a meltdown. Concentrate too much on not tripping and your accuracy will suffer. Concentrate too much on making your hits and your speed or balance will suffer. 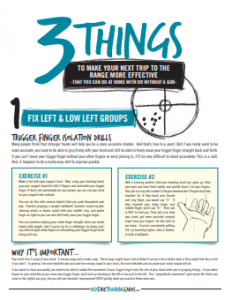 The key is to get to the point where you don’t need to concentrate on speed, balance, OR gun handling…you just do all of that automatically and concentrate on tactics. This is possible because the more you practice a skill, the less brainpower it takes to do. But your brain likes to code things in context. So, if you do all of your shooting flat footed, and then suddenly try to shoot on the move, the brain looks at it as a mostly-new skill…especially the visual aspects. And if you’re doing it for the first time when your life is on the line, sub-par performance is pretty normal…especially if you’re not used to moving laterally quickly…let alone moving quickly and shooting accurately at the same time. If you practice drawing and shooting precisely and moving fast laterally at the same time, the movements will get stored together and you’ll be able to fire them off as a single complex sequence of motor outputs from the brain…automatically, with high accuracy, with minimal conscious thought required for the individual steps…leaving you more bandwidth to judge whether the threat still needs shooting, finding cover, looking for additional threats, and thinking tactically. It’s not magical. It’s not something that only “elite” shooters can do. It’s just a simple step-by-step process that, done correctly, doesn’t take a ton of time or effort. Using old-school training methods, this takes thousands, if not tens of thousands of reps to become safe and proficient at moving and shooting. And that is why most instructors encourage shooters to move, then shoot instead of doing them simultaneously. But when you train correctly, it’s a quick process. Before you know it, lateral movement only slows down your drawstroke .1 seconds and your drawstroke doesn’t slow down your lateral movement at all. Which brings us back to the question, which is best for YOU? Shoot & move or move then shoot? Like I said, for most people, the answer is to move to cover, then draw, then shoot. You’ve got to know your performance envelope. Fortunately, this is pretty simple. Pick a man-sized target with a safe backstop that’s 10-20 feet away. Turn on your laser & leave it on. Aim your gun at the middle of the target so you can clearly see the laser. See how quickly you can move 5-10 feet laterally and keep the laser on the target. Try shuffling vs. rotating your body to see which works best for you. Play around with speeding up and slowing down to see what kind of effect it has on how much the laser moves. When you get to where you can move at 80% of YOUR full speed and can keep the laser on the target, then start standing with your pistol holstered and see how quickly you can move laterally, draw, and get the laser on the target. It’s important to note that I’m suggesting that you do this drill with an always-on laser and not one that just turns on when you press the trigger. 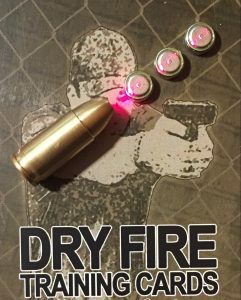 You want to develop the habit of getting your muzzle on target and keeping it there, but you don’t want to develop the habit of having your finger on the trigger when you’re not ready to shoot. So, the core of this drill is an efficient flat-footed drawstroke. An efficient drawstroke will be faster with less effort because there’s less wasted movement (obviously) but also because of how the brain works. The brain will actually fire off the sequence of motor outputs quicker and you’ll make your first hit on target quicker without feeling like you’re working any harder. What that means is that two shooters can spend the exact same amount of time training and one can be dramatically faster and more accurate…just because they train smarter and more efficiently. That’s what every shooter wants—better performance with the same or even less effort. And when you get the fundamentals nailed down at a high level, all of a sudden you’ve got more brainpower to spend on tactics…and then the real fun starts. Check out the training, see an example video, and find out how you can get a free 9mm laser bullet now by clicking >HERE<. 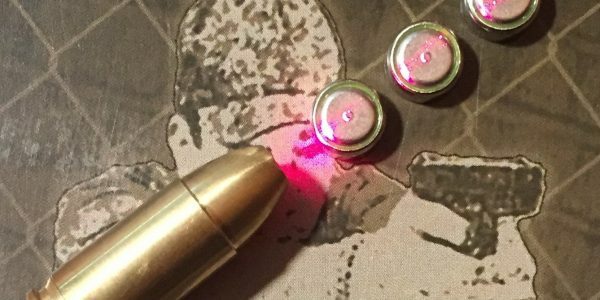 I’ve been testing more than a dozen different laser bullets and ordered a small batch to test quality and customer demand. These first few are free to good homes like yours, but when they’re gone, they’re gone.